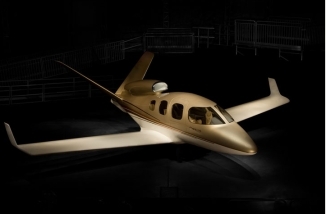 Cirrus Design has taken the initial wraps of its long expected small jet. This single engine plane, dubbed "the-jet", will have seating for up to 5 adults and 2 children. According to a report in the Wall St Journal (subscription required) more than 180 pilots have put down a $100,000 (refundable) deposit to make sure that they are in line to get the new plane. If you're interested in signing up there's a form on the cirrus website. The-jet is targeted for certification in 2010 and will have a range of about 1,000 nautical miles and a cruising speed around 300 knots. Just like it's propeller driven Cirrus brethren, the jet will have a built in emergency parachute. The price is expected to be about $1m, which is lower than the price of the very light jets which are starting to come to market.